Most cabinets are FM approved and all come with a ten-year warranty.893000 Flammable Cabinet, 2 Manual Doors, 30 Gallon, 44'' x 43'' x 18''. 893020 Flammable Cabinet, 2 Self Closing Doors, 30 Gallon, 44'' x 43'' x 18''. 893040 Flammable Cabinet, 1 Self-closing Door, 30 Gallon, 44" x 43" x 18". 894500 Flammable Cabinet, 2 Manual Doors, 45 Gallon, 65'' x 43'' x 18''. 894520 Flammable Cabinet, 2 Self Closing Doors, 45 Gallon, 65'' x 43'' x 18''. 894540 Flammable Cabinet, 1 self-close, 45 Gallon, 65" x 43" x 18". 896040 Flammable Cabinet, 1 self-close, 60 Gallon, 65" x 34" x 34". 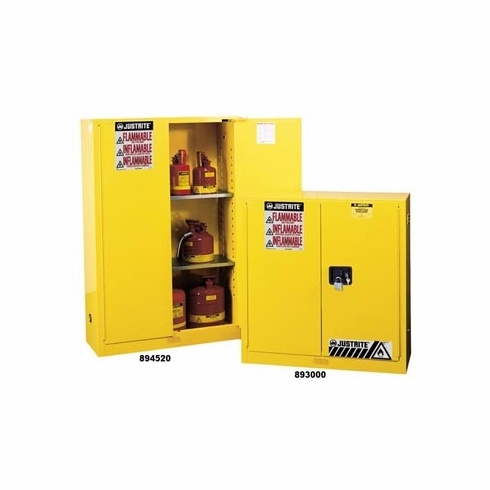 896000 Flammable Cabinet, 2 Manual Doors, 60 Gallon, 65'' x 34'' x 34''. 896020 Flammable Cabinet, 2 Self Closing Doors, 60 Gallon, 65'' x 34'' x 34''. 899000 Flammable Cabinet, 2 Manual Doors, 90 Gallon, 65'' x 43'' x 34''. 899020 Flammable Cabinet, 2 Self Closing Doors, 90 Gallon, 65'' x 43'' x 34''. OSHA & NFPA Compliant Freight Varies on Location, Dock or No Dock Average Freight Calculated at Checkout Actual Freight Charge May Vary.